I am Alebel Abate. I was born on May 12 1992 in north Wollo zone Lalibela, Ethiopia; my father’s name is Abate Tarekegn and my mother, Yezena Getaneh. My father was a farmer and my mother was a housewife. I have two sisters and two brothers. We were living together until my parents got divorced. This was the time, in which my life became complicated. I was only seven years old when they got divorced because of a health problem. Since my mother’s economic situation didn’t allow her to bring me up or look after me, she sent me to be with my father. When I was living with my father, I did jobs like keeping sheep, goats and cows. Moreover I also carried wood and fetched water from the river in a big pot. One day when I was keeping the mentioned animals, one big cow pushed me to the edge of a cliff because of which I was heavily injured. One of my friends, who was keeping a goat, found me in that valley three days after the accident happened. For three days I didn’t eat anything, I didn’t even have a sip of water. My father and his neighbours took me home. My father didn’t take me to the hospital and my wound became infected. He kept me for an entire year without any treatment or medication. An older person gave me a traditional medicine but in fact this medicine made it even worse. I still don’t know why my father didn’t take me to the hospital. One year later my mother took me to Lalibela. She began to treat my wound. She tried it in the traditional way, like giving holy water to me, but she also took me to the hospital. In the hospital they just said that it was too late for an operation, and that they couldn’t do anything except referring me to a bigger hospital in Dessie or Addis Abeba. At this time she was very sad, worried and angry, since her third child was in this critical situation. To be honest, her crying was more painful than the wound. The only thing she could do was pray to God, that He would heal me. One year after I moved to her house, when I was 9 years old, we travelled at least six times by foot to the holy churches of St. Bilbala Georges and Yemerha Khristos which are located 42km away from Lalibela. After half a year I finally recovered a little bit from my pain and I tried to do something to help my mother to pay back the huge debts she had because of the expenses for my treatments. I tried to collect firewood in the forest even though my wound was bleeding, because if she couldn’t pay back the debts, the person who had given her the loan would have taken her to prison. So my mother prepared and sold bread and a local alcoholic drink, which is called tella, and I collected and sold firewood and carried stuff to the market as a labourer. When I was ten years old, I recovered a little more from the wound and I started my elementary school in September 2001. In my spare time I still did the works I mentioned above. Since I was carrying the wood and stuff on my head, my wound was bleeding and hurting a lot. The infection was smelling very bad, therefore I always had to sit alone in school to not disturb my classmates. It was going on like this until I reached grade four. When I reached grade five my wound healed somehow. I believe that was because I travelled so often to St. Bilbala, Georges and Yemirha Khristos. You can imagine how hard it was to travel each time 42km by foot as a child. In my time during grade one to grade four not only my classmates ignored me, but also my neighbours and even relatives; simply everyone around me except for my mother. This made me feel so lonely that I asked God why He allowed me to be on earth. This loneliness is the reason why I still have difficulties to communicate with people, which results in psychological problems. Even though I was doing well in my studies, no one could appreciate me, not even after I received a certificate from my school. Due to the power of God and great effort of my mother I finally finished grade eight with nice results before I was allowed to go to high school. But at this time we couldn’t afford the school uniform and other materials that are needed since my mother became sick and couldn’t earn money to support me. I had to work the whole day seven days a week for two months until I had saved enough money to finance my high school studies. Although I could join high school after two months of working, my life didn’t become easier. In school I struggled because I had missed a lot in the time I was working, furthermore I had to take care of my sick mother. Often I went to school without having food for the entire day – not even a single piece of bread. The only option I had was going to school on one day and on the other day working to be able to afford food and the other simple mandatory expenses. I continued in this way until I graduated from high school. When I was in grade ten, the last year of high school, I finally recovered totally from my accident: I didn’t feel pain anymore and the wound was healed except for the scar on my head which I still have up to now. I tried to make friends by helping other students with their homework, class work and even giving them access to cheat in exams. Somehow I was feeling confident because I had a lot of friends around me then, although they were just taking advantage of me. In 2009 I passed successfully the high school finals. In 2010 I joined university preparatory school. There you have to choose between social- and natural sciences. I started studying social sciences because I wanted to find out why people dislike and ignore people who are suffering from poverty, disability or health problems. Moreover I wanted to learn how to develop a mind for business and become an entrepreneur even if someone comes from a poor family. In 2010, when I was in grade eleven, I earned money by teaching students from home to home and by trading on Saturday market as a retailer. Like this I could get money for my family and I could pay for all my student materials like the uniform, books, hardcopies and so on. Grade twelve is the year in which every student’s future is decided. I had to follow every step to score a good final result, in order to change my life. 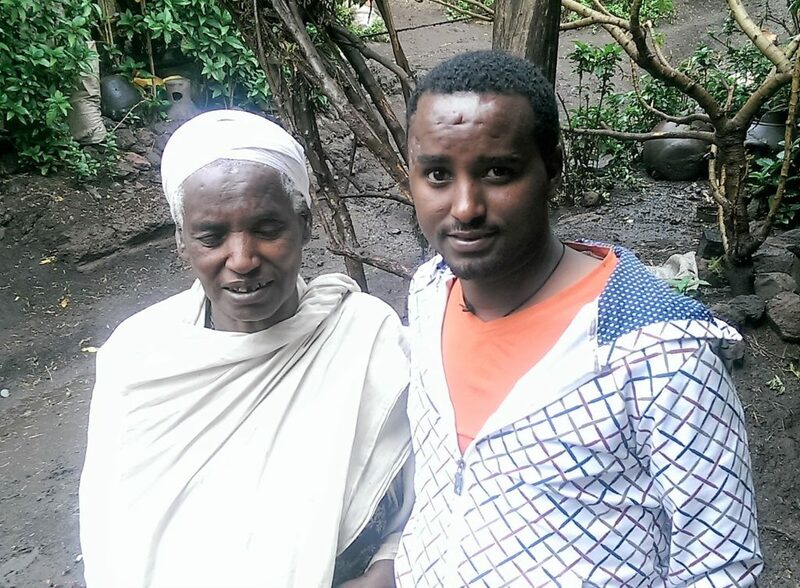 Unfortunately at this time I had to face a new problem: My beloved hearty mother became blind. A new difficult chapter of my life began. On one hand I needed every minute to take care of my mother; on the other hand, I had to focus on school, to be able to join a good university. I had to cancel classes for one month to work and save money for my mother’s medication. Thankfully I could save a little money by teaching and selling my closet, which my friends had bought for me as a reward when I stood first in every class. Furthermore I begged my relatives to help me pay for the treatment in a town called Woldia. Woldia is 180km away from Lalibela. We walked more than seven days until we reached the hospital. But unfortunately they could only tell us that her eyes were not curable anymore, because the retina was already too damaged due to all the dust when she was working. After one and a half months of cancelation I started grade 12. The school director wanted to drop me from school, but after explaining the reasons and a long discussion, he gave me a last chance. With the help of God I finished grade 12 with a good result. In the time between grade 12 and joining university I had three months time to earn money for the transportation to Gondar, where the university is located. I again taught students, bought and sold eggs and other similar things. 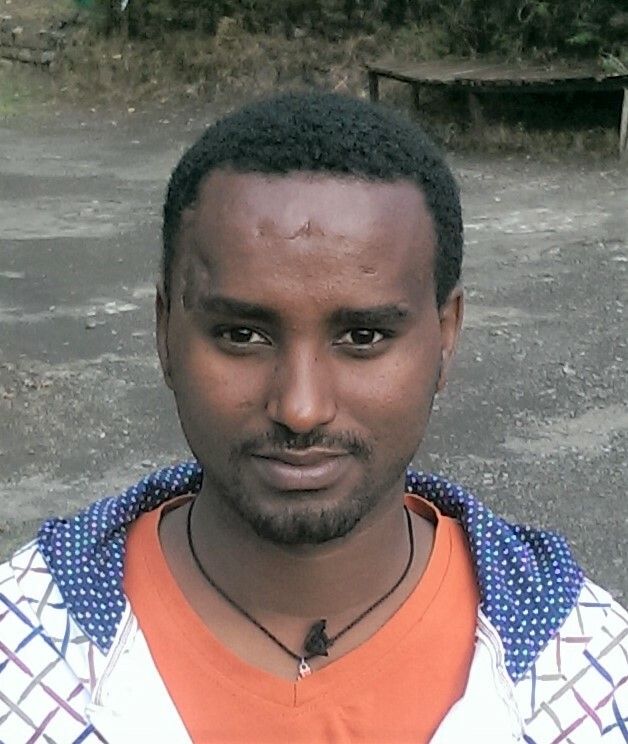 In 2012 I joined the university of Gondar and started to study tourism management. The following three years were very difficult for me, due to my financial and social problems. The first and heaviest problem was the lack of money to buy the basic studying materials, like softcopies and handouts. In order to earn a little money for those expenses I tried to find work, but I didn’t have much time because most of the time I was busy with the university program. I applied to many companies but most of them just ignored me and didn’t even invite me for an interview. Despite those obstacles I found a way to continue my studies anyway. I borrowed the handouts from my friends and returned them as soon as they asked for it, even though I hadn’t finished it. I also spent a lot of time in the library and read many new as well as old books. Once I was very sick of an unknown disease. After three days of not eating anything my state of health became worse and worse. Finally my two best friends managed to collect 100 Birr from other students, took me to the hospital, brought food and took care of me. They saved me from dying. I will never forget it and I will always try to pay back their love and devotion. Another big problem was missing my blind mother and knowing that she actually needed my help. Once in a while I called her from a telephone booth. When I talked to her, she was crying. She had no money to send me, she didn’t even have enough to cover her own monthly expenses. After long discussions with my relatives I could convince them to send her 50kg wheat so that at least she didn’t starve. Finally I finished the first term. Maybe God understood my problems and helped me to score the best result of my department. In the three months break time, I again taught students to cover my mothers expenses. After three month I went back to university and continued like in the first year. I again scored the best result in my department before I returned home and worked for three months, did some paper work and learned for my last term of my studies. In the third and last term there were many expenses, but my friends collected money for me and even bought me a suit for graduation. After graduating I started looking for a job. I hoped that the university would hire me but I haven’t been lucky. The university couldn’t hire new staff due to financial problems. I applied to so many companies and hotels. They liked my paper and my graduation score but as soon as they saw my scar on my face they didn’t give me a chance. The only option I had was joining government office to work for a very low salary that didn’t even cover my monthly expenses. After one year of working there a kind hotel owner employed me. Although the salary wasn’t much higher I at least could work in my field and practice my profession since I graduated in hospitability industry. Now I am 25 years old and I’m living with my mother and two elder brothers. But all my family relies on me. For the future I’m hoping to get support for a master’s degree, to become able to lead my family out of poverty.